The UK's corporate regulatory system is "not fit for purpose" and would be overhauled under a Labour government, John McDonnell is to say. In a speech, the shadow chancellor will say there "will be no more Carillion scandals on Labour's watch". The firm, which employed about 20,000 people in the UK, collapsed with £1.5bn of debts in January. Two MPs' committees said in a report this week it showed regulators were "toothless". Speaking at a Labour event in central London, Mr McDonnell will say that he has commissioned an independent review of the UK's corporate auditing and accounting regime, by Prem Sikka, professor of accounting and finance at Sheffield University. His findings will then be fed into Labour proposals to reform the regulatory system. Mr McDonnell will say the MPs' report this week "once again highlighted the catastrophic failure and inadequacy of our regulatory system". Accounting and pensions regulators "have once more failed to do their jobs" he will say, and the lack of transparency means "nobody ever seems to be punished for their transgressions". He will criticise the "regulatory maze" - citing 29 regulators for the financial sector alone - for creating opportunities for "waste, duplication, obfuscation and buck-passing". "That is why it is essential that we have a crackdown on poor practices in the accounting and auditing industry," he will say. "Under the next Labour government the big six firms will not be allowed to continue to act like a cartel that prevents new market entrants or drive down standards. "Otherwise it will further infect the rest of our economy and business community. " Thousands of people lost their jobs when Carillion collapsed in January. It held numerous public contracts, such as the maintenance of schools and prisons, all of which had to be brought under government control, at a cost to the taxpayer. "Carillion could happen again, and soon"
And former chairman Philip Green said the board had "always strived to act in the interests of the company and all its stakeholders". 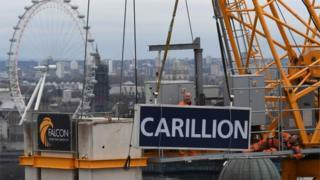 Responding to the MPs' report, a KPMG spokesman said it had conducted its audits of Carillion "appropriately", and Ernst & Young said it was "disappointed that despite all efforts the business was not rescued". Deloitte said it was "disappointed" with the committees' conclusions while PwC said it was helping save "thousands of jobs" as the official receiver.